I have been asked by a potential customer: “Do I need the Fact Pure Substances or SGTE Pure Substances database?” The answer is: It depends. The two databases are both collections of (normally published) thermochemical data. The Fact Pure Substances database FactPS is maintained by our co-developer of FactSage, Thermfact/CRCT, Polytechnique Montreal. It is generally compatible with the Fact Solution database package (FToxid, FTsalt…). The SGTE pure substances database SGPS is maintained by the Scientific Group Thermodata Europe (SGTE) independently from any other databases, meaning that compatibility with other databases (including the SGTE solutions database) is not ensured. 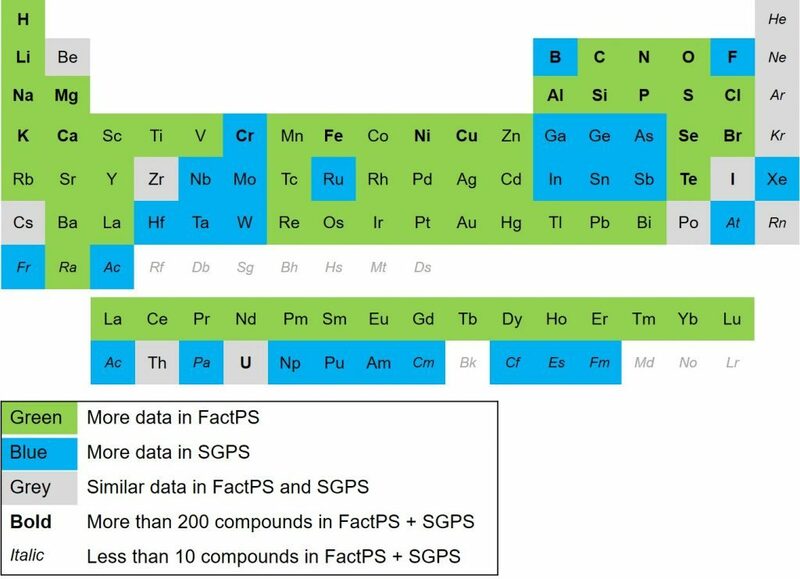 FactPS contains 4869 compounds (or compositions) and 6912 phases (states). SGPS contains 3842 compounds and 5751 phases. Please note that one compound (e.g. Fe) can be present in several different phases (bcc, fcc, hcp, liquid, gas, aqueous), which is the reason for the difference in number of compounds and number of phases. It should also be noted that FactPS does contain data for aqueous species, which is not the case for SGPS. • gaseous Fluorides, e.g. of interest in CVD applications. For all other applications, FactPS contains more data, so this is normally the database of choice. You can find the list of all compounds in FactPS here and the list of all compounds in SGPS here. Do you have a question concerning databases? Then please leave a comment or contact us!